New Delhi: As the NMOPS protest getting heater everyday, it looks like that this time the government employees won’t leave the National Capital till their demands are materialized. The protest of National Movement for Old Pension Scheme (NMOPS) workers has hit the streets of the national capital again on the fourth consecutive day as NMOPS Rajasthan and Telangana state units joined the ongoing protest in New Delhi, in a hope that the ruling government will materialize their demands. 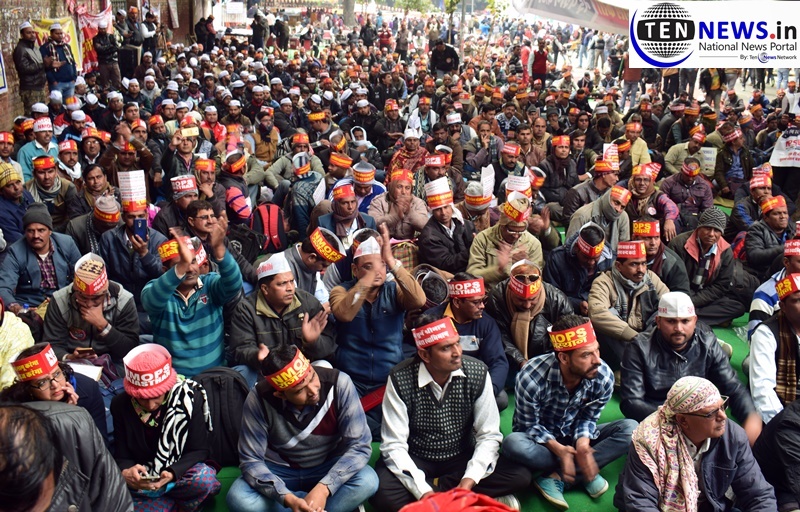 On January 28, the NMOPS began their protest in Delhi, in which thousands of government employees demonstrated against the ruling government which was still staged on the fourth consecutive day. A man in his fifties wearing a turban said in despair, “Who will financially help me in my old age, how I will respected life without money, this time the deaf government has to listen our voice”. The protesters claimed that if a person is elected as a corporator, lawmaker or parliamentarian, they are eligible for pension even if that person has assumed office only for a day. # On retirement, the whole amount is given to the employee without leveling any taxes.